The turbine inlet butterfly valve in a hydro power station is used as a safety device. The valve is located within the power house on the upstream side. It is basically a turbine inlet valve having less head loss. The hydraulic power pack is mounted on the driving end of the valves. For small and medium turbines where grid power is not available, the turbine inlet butterfly valve is opened by a hand pump. For large power plants where grid power is available, valve is opened with the motorized operation of the power pack. The turbine inlet valve is provided with a bypass arrangement from the upstream side to the downstream side. The valve is opened so that the pressure in the both sides of the valve is in equilibrium condition. 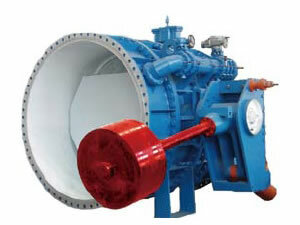 The turbine inlet butterfly valve adopts hydraulic driving mode. 1. The turbine inlet butterfly valve is featured with high automation. 2. Switching on and switching off are controlled by hydraulic heavy hammer. This ensures the safety and reliability of the turbine inlet valve. 3. Compact structure can save much more space. 4. 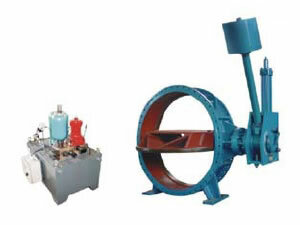 The turbine inlet butterfly valve is of double eccentric structure. 5. Nominal diameter of our turbine inlet valves varies from 800 to 3000 mm. Nominal pressure ranges from 0.6 to 2.5MPa. Corroco International Industrial Co., Ltd is a professional manufacturer and supplier of turbine inlet butterfly valves in China. In addition to this turbine inlet valve, we also produce metal hard sealing butterfly valve, hydraulic control butterfly valve for pumping station, anode rod for water heater, hydrometallurgical electrode, hydrometallurgical equipment, metallurgy technology and engineering, machining and parts, etc. Based on 12 years' production experience, our products have been exported to the United States, Canada, Britain, Germany, Iran, Pakistan, India, Kuwait, Dubai, Saudi Arabia, the Philippines, Malaysia, Singapore, Congo, Turkey, etc.